Are you serving the bird this year, feverishly looking for new ways to cook traditional Thanksgiving dishes? If so, here is an old Bilowz family recipe that may do the trick. 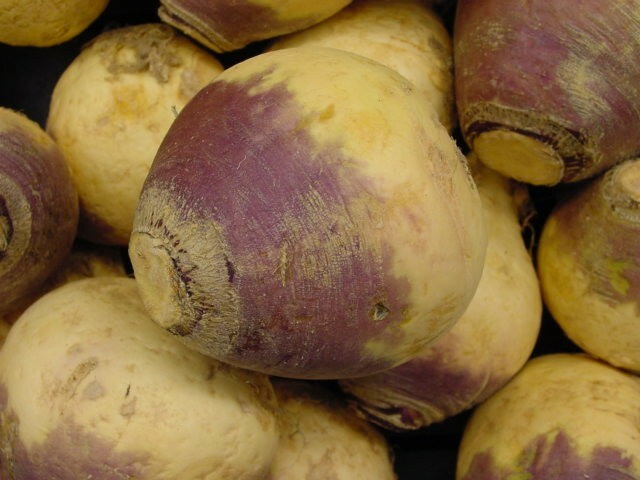 This side dish uses a root vegetable, Rutabaga, often called the ‘Swede’ or Yellow turnip. Rutabaga or any turnip is considered a tad strong if served by itself. Combine this vegetable with a Thanksgiving favorite, potato and you can add a new dimension to your side dishes. You may adjust the proportions of this recipe to taste. Note: you do not want more rutabaga to potatoes. The potatoes and egg blended together give it a soft, soufflé texture. Too much rutabaga will cause it to flop. This recipe serves 8 to 10 people. Peel, cut and boil equal quantities of potatoes and rutabaga. Use approximately 3 pounds of potatoes to 1 to 3 pounds of rutabaga, about a ½ to a whole medium-sized rutabaga. Boil separately as potatoes and rutabaga require different cooking times. Drain, mix and mash together in a bowl. The consistency should be creamy; no lumps please. You can also add ¼ to ½ cup of grated Asiago, Gouda or Swiss cheese for extra savory flavor. Mix all together and place in an uncovered casserole dish and bake in a 350 degree oven for 20 to 30 minutes until it puffs up and is slightly browned. So as we head into the frenzy of the holiday season, the inspirational thought for the day is by an anonymous chap. “Eat drink and be merry, for tomorrow they may make it illegal.” I’m rooting for Rutabaga and that we keep our Thanksgiving traditions of food, family and football.